My husband and I celebrated our 4-year wedding anniversary this month. His gift to me was the opportunity to use my passport for the very first time. It was the best gift ever, even if the trip didn’t go as smoothly as we had planned. Basically, it was one of those trips where, if it could go wrong, it did. We drove to Thunder Bay in Ontario, Canada. It is just over the border from Minnesota, about a six hour drive from Minneapolis. Once you get to Duluth, the rest of the trip is along the beautiful coast of Lake Superior. Every time I see this lake I am marveled by her beauty. When the sun shines on her frigid waters, she smiles back with the colors of the Caribbean. But don’t be fooled by her siren’s call. Although she may resemble the warm waters of the Caribbean on the outside, if you dive in, you’ll quickly learn Lake Superior more closely resembles a freezer than a hot tub. That being said, her majestic beauty is unrivaled in this area. The shores of Lake Superior are truly a place of inspiration and wonder. Perhaps it was the spell of the lake or just Ryan and my excitement of getting out of town for a long weekend, but we felt untouchable. We had high hopes for the days ahead and spent the hours in the car planning our trip, discussing the places to visit, and mapping out a schedule for the weekend. We stopped for lunch in Grand Marais at the Crooked Spoon Café and had a lunch that rivaled Peg Leg’s grouper sandwich. We both ordered the fresh Lake Superior trout that was sautéed with a crispy cornmeal crust and served on a toasted ciabatta roll with lemon basil aioli, tomatoes, red onions and lettuce. It was simply amazing. I’m not sure which was more impressive, the fish or the bread. Usually that isn’t even an issue, but the roll was so wonderfully crispy on the outside, warm and soft on the inside and was the perfect match for the fish that it was tough to decide which I liked more. And the lemon basil aioli was the only condiment worthy of this incredible sandwich. Writing this makes me want to get in the car and drive to Grand Marais to get another one. At least it’s a shorter drive than Pensacola Beach! After lunch, we stopped at Beth’s Fudge & Gifts and picked up some fudge for the trip – caramel chocolate. It was so good that we stopped on the way back to Minneapolis and got another small box! The fudge was creamy and rich, and the caramel had that wonderful homemade flavor. I need to try adding caramel to the top of the Never Fail Fudge recipe. After we filled up on fish and fudge, we began the last stretch of the journey to Canada. We were about 15 miles away from the border when we noticed that the road had become very loud. We surveyed the asphalt and it didn’t appear any different than what we had been driving on, so to be cautious, we pulled over and examined the car. Sure enough, we had a flat tire. This stretch of road has woods on either side, is far from any semblance of a town and is out of reach of a cell tower. Of course it is, where else would my car decide is the best place to breakdown? Ryan and I looked at each other and nearly at the same time asked, “Do you know how to change a tire?” I pulled out the owner’s manual as Ryan dislodged the spare tire and jack. While we began to wrack our brains trying recall the lessons from driver’s ed in high school, a woman pulled over and called out to us, “Did you lose your dog?” It was then that I noticed the beagle sitting in her lap, looking eagerly at us from the open window. I explained that we were trying to fix a tire and that yes, we had a dog, but we dropped him off at “camp” that morning, almost six hours away, and he didn’t look anything like the one struggling to jump out of her car. She introduced herself as Anne and immediately offered to help. She said she knew some people just up the road in Grand Portage and offered to take us there. Ryan got in the car with her, the beagle quickly leapt into his lap, and I stayed with my poor broken down vehicle. As they drove away, I thought of how this situation was the opening plot to so many slasher films I’d seen and quickly wrote down the license plate number…just in case. But then I looked into the thick woods along the side of the highway and realized that I was the one more likely to fall victim to a killer like the Hook Man and poor Ryan would be the one to come back to find nothing but an empty car and a bloody hook stump left dangling from the door handle (I must remember to thank my dad for telling me that story as a kid, as you can see, it left a lasting impression). As these nightmares danced around in my head, my bladder gave me a moment of respite from the horror by reminding me of the three diet cokes I’d had at lunch. I tried to read a book to take my mind off of everything, but couldn’t concentrate. My attempts at trying to write in my journal suffered the same result. Instead, I thought of my poetry group. Every Thursday night when the group meets, we usually chat for a while before getting down to business. Quite often, someone recounts a tale that makes us laugh until tears roll down our cheeks or leaves our jaws suspended in a stunned silence. Regardless of the effect, we always call out the same response to the storyteller: “There’s a poem in that!” As I sat in my current predicament, I could clearly hear their voices in my head telling me those words I had said to so many of them over the years. I was sure there were words to describe this scene, and once I was a little farther removed from the situation (and had emptied my pounding bladder), perhaps I could find them. And maybe I’d even be able to chuckle about this little misadventure too. About 20 minutes later, a man pulled up and said he’d heard I needed some help. I looked at him and said, “Have you seen my husband?” He replied that Ryan was right behind him and sure enough, the car with the kind stranger, my husband, and the crazy beagle pulled up moments later. As the man showed Ryan how to change a tire, I used Murphy’s leash to walk the beagle around so that he wouldn’t pee in the nice lady’s car. As I leaned down to pet him, I noticed rib bones protruding from his side and wondered if there was anything in our car I could offer him as a snack. I found some granola bars, not the best thing for him to eat, but better than the dead mouse I had just pulled from his mouth. No sooner had I unwrapped the first bar than he had swallowed it…whole. Not good. He was anxiously trying to get to the box so I unwrapped another and carefully broke it into pieces before feeding the dog. It didn’t matter, he barely chewed them. Although he was little, his hunger took over and he became hard to control. I broke up one more bar hoping that it would help ease his empty stomach then took him back to Anne’s car. Black eagle on weathered blue siding. one who lives for the sound of my voice. These lines are about “my” dog, Dorie, that lives with my parents (technically she’s my parents’ dog, but we have a very special bond and I love that dog very, very much). Dorie recently had emergency surgery for bloat and nearly died. I haven’t stopped thinking about her since I found out, so I wasn’t surprised these were the words that came to me. It would have meant a lot to share those lines with Anne and I couldn’t believe that I recalled them only moments after she had disappeared from my review mirror. We pulled over at the gas station in Grand Portage so that I could relieve my aching bladder and Ryan could double check the spare tire. It’s a good thing we checked because the tire was already low on air. The first air pump we tried was broken – of course. As we began to lose hope of ever crossing the border into Canada, a gas station attendant informed us of another pump by the car wash. Although this one was finicky, it finally worked and we were back on the road. As we drove, Ryan told me about his ride with Anne and said he wished I had been the one to ride with her because we had such similar interests. She was an amazing story teller, he said, and gave him the history of Grand Portage, told him of her poetry and song writing, and gave him tips of things to do (and not to do) in Thunder Bay. I told him of her request and how bad I felt that I had been unable to provide her even a few lines of my poetry. So I have a request: if anyone out there knows Anne from Grand Portage who writes poetry and songs, works at the casino, has taken on the job of becoming a Census worker, and rescues lost dogs and stranded travelers from the side of the highway, please tell her to contact me (thefoundrecipebox@hotmail.com). I owe her a poem. And I have just the poem in mind. Ironically, the title is Lost Along the Way. How fitting not only for this blog, but also for the entire story of our trip to Canada and how we met Anne. It is the poem whose lines came to me moments after our departure and I would be honored to share it with her. And I really hope the dog didn't puke in her car. If he did, I owe her a little more than a poem. And to everyone from Grand Portage who helped us out, thank you. We are so grateful for your help and cannot express enough how thankful we are for your generosity and kindness. The world needs more people like you in it. There is much more to this story, I haven’t even gotten to the part where we finally cross the border, but it will need to wait until the next post. This one is quite long enough already. And I haven’t even gotten to the recipe yet, which has a story all its own. As I mentioned, Ryan and I celebrated our fourth anniversary this month. The tradition for your first anniversary is to eat the top of your wedding cake that has been frozen for a year. However, we never got to do that because ours was stolen from our reception hall. Even though I’ve been told that 1-year old frozen cake is gross, I was still mad because our wedding cake was exquisite. The bakery we used was Lovin Oven Cakery (if you’re in the Chicagoland area and need a cake I HIGHLY recommend this bakery, they are amazing) and the flavor of our cake was “strawberry shortcake.” It was a white cake with a fudge layer, custard layer, strawberry layer and white frosting. It brings tears to my eyes, even four years later, thinking about someone else eating the top layer of our cake. 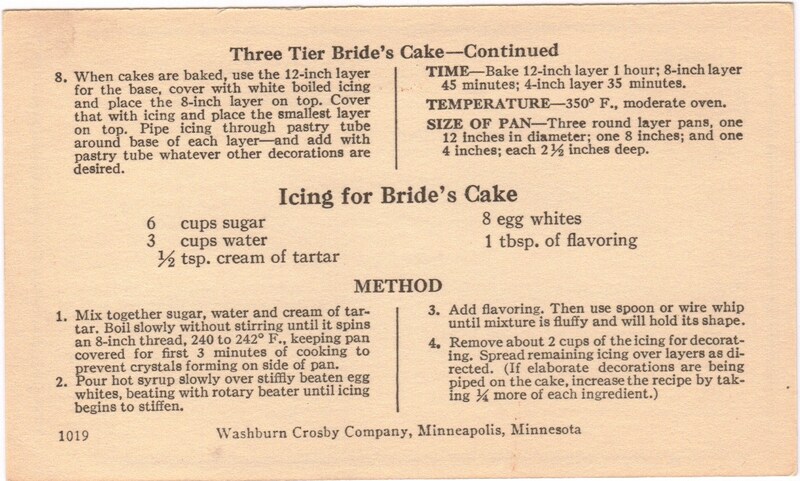 As always though, The Found Recipe Box provided the perfect recipe for this momentous occasion: Three Tier Bride’s Cake. Perhaps a 3-level cake was a bit much for just Ryan and I on our anniversary, but since we never got the top layer of our wedding cake, I thought we deserved it. 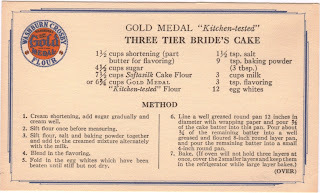 Please note, if you do make this cake, make sure you have A LOT of people to help you eat it. It would be perfect for a graduation or anniversary party. The cake itself is a dense, heavy bread-like cake. It doesn’t have the typical sugary cake taste and a small piece will fill you up quickly. 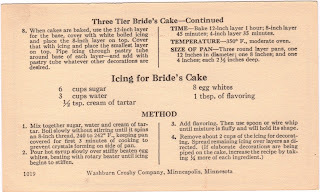 The recipe card calls for another boiled icing, my nemesis, but I chose to search the web for something a little tastier for my anniversary cake instead. The recipe I used was for “Creamy Chocolate Frosting” and I found it on allrecipes.com (click here for the recipe). Since the cake was so large, it required a double batch. This is a great frosting recipe and I will definitely use it again. I attempted to decorate the cake with little white flowers and a shimmery cake glitter, but my cake decorating skills definitely need some work. I’m still working on writing the poem from our tire blow-out adventure. I think I needed to write the whole story down first before I could choose the pieces that were deserving of a place in a poem. In life, especially in the kitchen, it seems that the best stories come from unexpected places and most of the time, those are misadventures. Sure, our trip didn’t go smoothly, but we have some great stories to tell as a result. And the best part was that we experienced it all together. I guess you could say this trip was somewhat of a metaphor for the past four years of marriage. We’ve seen some breathtaking views and we’ve hit some bumps along the way, but regardless of the experience, we’ve been by each other’s side through all of it. There isn’t a chocolate recipe in the world sweeter than that. Thank you, Ryan, for these amazing years. I can’t wait to see what the future holds for us. 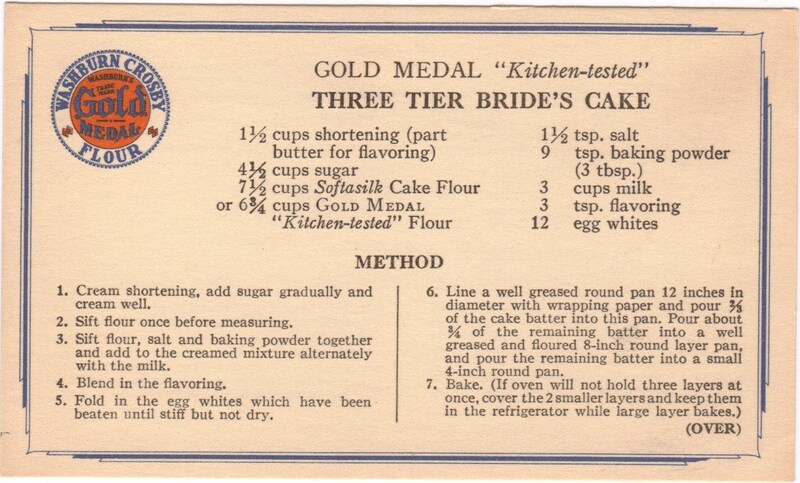 Something tells me, no matter what we encounter; there will be a recipe in the box to help us tell the story. Happy 4th anniversary, I love you with all my heart. Good luck with the poetry mentorship! I'm trying (for the umpteenth time) for the fiction.